ENG: Flowers are everywhere! You can find them on dresses, tops, skirts, bags, shoes and even on cosmetic boxes. I really can’t get enough of them! RU: Цветы расцвели повсюду: на платья и юбках, футболках и сумках, обуви и даже на косметических продуктах. Для меня много цветов не бывает, особенно в теплое время года! TR: Bu sezonun konsepti bence kesinlikle çiçek desenli giyisiler. Hemen hemen tüm ürünlerde çiçeklere rastlamanız olası. Tşortlerde, çantalarda, ayakkabılarda hatta kozmetik ürünlerinde bile bulabilirsiniz. Sizin favori çiçekli giyisiniz hangisi? Виктория, платье №8 однозначно в Вашем стиле! Интересная подборка! Обожаю цветочный принт! Коллаж получился ярковесенний! Целую! I loooooove flowers too! I even try and wear them on Winter with dark clothes. They're so pretty and feminine! I'm so such it's amazing! Thanks a lot! 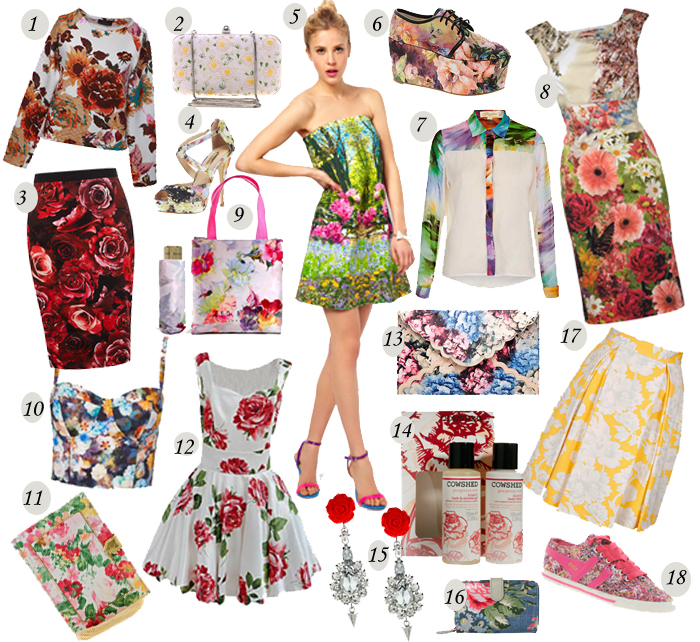 oh these florals are to die for! ahaha, yeah, I'm totally agree!!! Loooove floral! I just updated a new post on my blog that has flowers as my background too! Flowers are so pretty and magical! This stunning floral collage made my head spin...in the best of ways. I love absolutely everything you have picked out... seriously, there isn't anything that I don't want from this pretty list. love this trend, nice mix! These pieces are so lovely. I love this style. Perfect for this season. Gorgeous dresses. Great post my dear !just love the flower power boom! I'm such a sucker for floral prints. Love that strapless dress. The 5th dress is just amazing!